Who doesn’t love a good birthday knees-up? Over at Coral Casino, they’re celebrating the one year anniversary of their ever-popular live casino section. To mark the occasion, hundreds of lucky customers will be treated to incredible prizes- cash and tech gadgets, in one of the biggest prize draws Coral has ever held. So, if you like the sound of winning some of these incredible birthday gifts, why not get involved with the Live Casino Birthday Bash promotion today? 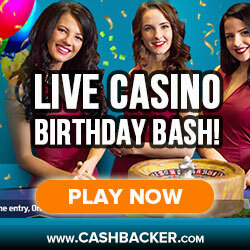 There are some truly impressive prizes waiting to be won with the Live Casino Birthday Bash. Gadget lovers will rejoice to hear that there are 12 Apple iPhone 7s up for grabs and 12 Apple iPad Pros too! As well as these nifty gizmos, there are also real money rewards ranging from £10 all the way up to £365 on offer. & Get £50 Bonus + 10% Lifetime Cashback! To try out your luck at Coral’s anniversary offer, all you have to do is sign in to the site and deposit at least £20 on any game in the live casino section. As long as you wager and play during the promotional period; November 25th and December 4th, every £20 you stake will earn you one entry to the big prize draw. The lucky winners will have their accounts credited and be contacted by site staff on Monday, 5th December, the day after the draw is held. This offer is open to all Coral Casino customers aged 18 an over, both new and existing. Only game-play during the promotional period will count towards the prize draw, so make sure you wager during these dates. The winners will be picked at random on December 5th. Each player is only eligible for one prize each. Please make sure that your contact details with Coral are update and correct, as any rewards not claimed with 24 hours will be revoked.